Some of you may have noticed a lack of a weekly recap for this week - I went away for the weekend and where I went not only had no WiFi but it was a struggle to get reception on a phone. 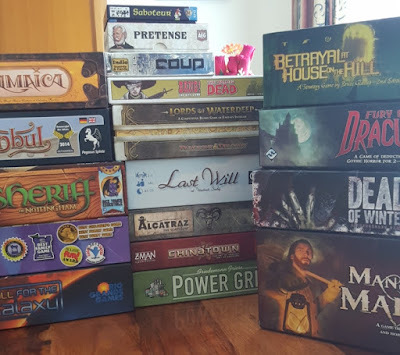 So instead of the weekly recap this edition will also feature this weekend which includes six people, two nights and a whole lot of board gaming..
Istanbul: To kick off this weeks edition is a game I really don't know why I don't play more! Two weeks ago I bought one of the expansions (opted for the latest one - no reason for this as I'm sure I'll get the other eventually..) but I told myself I couldn't play it until I've played basic Istanbul at least 10 times. Expansions can be great and add a heap to a game experience but they also can be great value for money by extending a games playability. Love a game, play it to death, get bored, buy the expanion and it's a whole new game again. As must as I'm sure I'll enjoy the expansion, I really enjoy Istanbul the way it is at the moment and it was nice to get a couple of plays in this week! Sheriff Of Nottingham: I've owned this game for nearly a year and had only played it once (right after I bought it) as I didn't really like it and kinda regretted purchasing it. There were two new gamers we were trying to ease into the hobby on the weekend so I thought this might be the time to give Sheriff one more try. Great success. Enjoyed it so much more than the first time I played it and feel I need to play it some more before deciding whether I like it or not. Was one of the favourite's for the two we were trying to get involved so it worked perfectly for what it was intended to do. Pretense: The game that is not really a game but kinda is at the same time. Described as a 'meta-game' we played this during the first night with some modified rules to do away with player elimination. It's a very average game but we still managed to have a little bit of fun with it and it got us to laugh a couple of times. Not sure I'll be playing this any time again soon and while technically not a proper game it was voted the worst of the weekend by everyone. Coup: Had a couple quick filler rounds of Coup (which I just reviewed last week), it has it's place at the table and was used just to ease us back into things after the first night. Surprised to hear it was one of the new gamers favourites of the weekend. He didn't seem overly good at it but just enjoyed the concept. Chinatown: In a way I regret bringing this one. I actually preferred Pretense as I wasn't expecting much of it from the start, however Chinatown is reasonably rated as a good trading game. I'm sure it is and for some groups it might work really well - for me it just doesn't work. I might be bad at trading games and the fact I came dead last (which doesn't happen often) most likely has something to do with it.. but sometimes no matter how good the deal, people just won't trade with you. There is nothing in it for them other than the fact that they know you won't win and unfortunately there is nothing you can actually do if you just aren't getting traded with. Yes eventually you'll collect tiles or key spots your opponents want, but even then it can still be difficult if someone has determined they just won't trade. Maybe it's me, but I find a pure trading game like this doesn't really have enough skill too it and wished we were playing something else instead. And that concludes PART ONE. I'll update with the other five games we played in PART TWO around the middle of the week.